If Shakespeare’s The Merchant of Venice is the most famous play about a Jew in European literature, then the second most famous—following at a considerable distance—is Nathan the Wise, the “dramatic poem” published in 1779 by Gotthold Ephraim Lessing. These two classics present almost diametrically opposed pictures of Jews and Judaism, and it is a melancholy fact that the anti-Semitic play by Shakespeare is considerably more interesting than the philo-Semitic one by Lessing. This is the main reason why Merchant remains a central part of the theatrical repertoire, while Nathan, outside of Germany, is one of those works more often read than performed, and more often read about than actually read. Indeed, while even most students of Jewish history or the German Enlightenment could not tell you exactly what happens in Nathan, they would most likely know two key facts about it. First is that it was written by Lessing as a tribute to his friend the philosopher Moses Mendelssohn, whose benevolence and greatness of soul are reflected in the character of Nathan. In this sense, the play is a testimony to the dawning of the possibility that, under the auspices of secular Enlightenment, Christians and Jews—at least some of them—could come together on terms of equality and mutual acceptance. Not everyone in the late 18th century was willing to countenance this possibility: Lessing’s play was widely attacked by Christian writers, in part because of its author’s prior reputation for free-thinking, and it was banned from performance until after his death. What drew their ire in particular was the second famous thing about Nathan, the parable of the ring. Lessing did not invent this fable—he most likely found it in the Decameron, and it appears in other medieval sources as well. But in his telling, it became a classic statement of the modern liberal commitment to religious tolerance. There was once, the story goes, a father who possessed a ring of incalculable worth, and he promised it in turn to each of his three sons. Unable to choose who should receive it, he had two indistinguishable copies made, so that each son believed he had been entrusted with the authentic ring. When they discovered their predicament, the sons went before a judge and demanded to know who had the true ring, but he was unable to tell them and advised them instead that each should live as if he possessed the original. Of course, this way of thinking about religion only makes sense to those who can abstract themselves from their own beliefs, imagining that they might have been born or raised to believe differently. Like John Rawls’ original position, Lessing’s parable of the ring implies that a person’s religion is not an essential part of their being, but an extraneous addition, like a suit of clothing that can be taken off as easily as it is put on. Between this kind of believer and the kind who thinks that God is pleased by the stoning or burning of infidels—whether we’re talking about Spanish Christians in the 15th century or ISIS killers today—there is no real common ground. Like liberalism itself, Lessing’s tolerance may only make sense to those whose religious passions have already cooled; it is a feeble weapon against superstition and extremism. The virtues and defects of this vision of religious toleration are, in fact, on display throughout Nathan the Wise, not just in the famous ring speech. A recent production of the play, by the Classic Stage Company in New York, offered a rare opportunity to see how much work it takes for Lessing—as translated and adapted by Edward Kemp—to maneuver his characters into a closing tableau of comity. The play is set in Jerusalem in the late 12th century, just after the Muslim armies of Saladin reconquered the city from the Crusaders. Saladin himself, revered by Christians since the Middle Ages as a chivalrous foe, appears in the play as a wise and indulgent ruler. Just before the action starts, he has spared the life of a Knight Templar, one of the Christian soldiers who fought against him. This Templar, in turn, has rescued Rachel, the daughter of Nathan, from a deadly fire. The play begins, then, with Muslim, Christian, and Jew linked in a chain of gratitude, and while this chain is tested, it is never allowed to actually break. When Nathan returns to Jerusalem from a trading journey and learns of the Templar’s good deed, he is determined to reward him—possibly, he implies, with Rachel’s hand in marriage, since the girl is romantically obsessed with her savior. At first the Templar, who is part of a monastic order, resists these advances, but soon he is brought face to face with Rachel and falls in love. Meanwhile, Nathan has been summoned to the court of the kind but impecunious Saladin, who needs to borrow money from the famously wealthy Jew. In an attempt to intimidate Nathan, he poses the question of which religion is the best. But when he is answered with the story of the three rings, Saladin realizes that Nathan’s wisdom is superior even to his wealth, and the two men become friends. Significantly, it is the Christians in the play, not the Muslims or the Jews, whose fanaticism and intolerance threaten to ruin this brotherhood. Rachel’s beloved old Christian nurse, Daya, reveals a secret to the Templar: Rachel is not actually Nathan’s biological daughter, but a foundling he has raised since infancy. What this means, however, is that a Jew has kept a Christian girl away from her ancestral faith, and the Templar reports this fact to the local Christian patriarch. This threatens Nathan with disaster, until it is revealed, in the hectic denouement, that Rachel was originally the daughter of a Muslim—none other than Saladin’s lost brother Assad. To boot, the Templar himself is Rachel’s long-lost brother and Saladin’s nephew. Rachel, then, is the pivot on which the play’s ecumenical message turns. At the beginning of Nathan the Wise, Rachel is a Jew, as her name suggests; then she believes she was born a Christian; finally she is revealed to have been a Muslim. But the girl herself has not changed—she remains just as lovely and virtuous no matter her religious background. The effect is to underscore Lessing’s liberal conception of religion as a garment that can be taken on or off, not an integral part of the person or the personality. Yet it takes only a little imagination to wonder whether Rachel, who was presumably raised in a Jewish household with Jewish customs and beliefs, would be so pliable in the face of her sudden reclamation by Saladin. Lessing is writing about religion as a group affinity, rather than faith as an individual conviction; the former may be exchangeable, but surely the latter is not, at least not without paying a price. 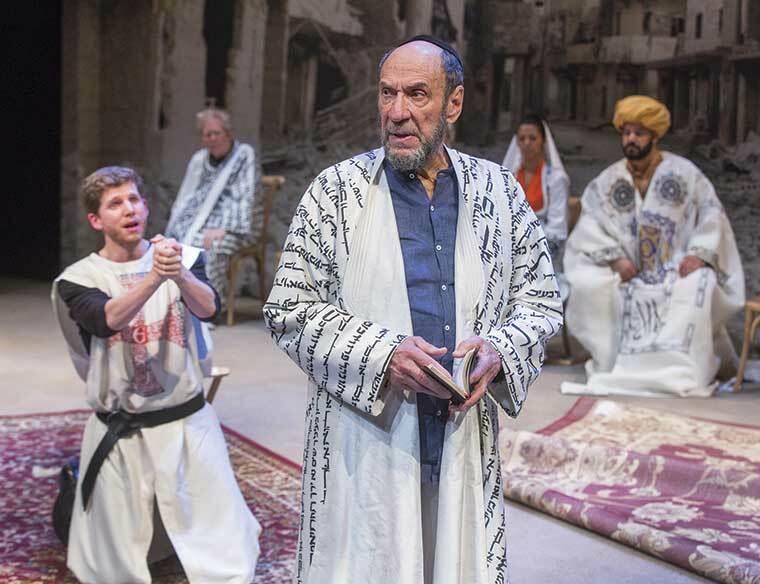 The Classic Stage production, directed by Brian Kulick and starring an imposing F. Murray Abraham as Nathan, turned Lessing’s concept of religion as a garment into a visible metaphor. Saladin, played by Austin Durant, was dressed in a flowing white robe covered in Arabic script, while Nathan wore a similar robe bearing Hebrew letters. This was religion as placard or logo—an effect reinforced by the staging of the opening scene, in which the actors shouted at one another in Arabic and Hebrew, until Nathan emerged to unite everyone in English. Here, too, was an interesting metaphor—English standing in for Lessing’s German as the language of modernity and harmony, replacing the ancient quarreling tongues. A similar effect was achieved by the use, as a backdrop, of a contemporary photograph of a war-torn Middle Eastern city, which was not identifiable. This choice was justifiable on dramatic grounds—Lessing’s Jerusalem was, indeed, a postwar city—but it also reinforced the sense of the whole region as a timeless scene of eternally recurring grievances. Religious strife and bigotry, it seems, are things that happen over there, not here among us. Today, in America, the conventional wisdom is that things are reversed: Now it is Jews who are accepted, even powerful, while it is Muslims who are the targets of hatred and discrimination. With this in mind, the Classic Stage production made the demonstrative choice to have two of the actors greet the audience, after intermission, with an actual recitation of Islamic prayers. This ecumenical gesture was all the more significant since the actor playing Saladin was one of those at prayer, and so he borrowed his role’s dignity: This was not just a foreign religious rite, but an imposing one, worthy of respect. If it had been Nathan up there saying ma’ariv, the effect would have been quite different—and possibly more in line with Lessing’s original intention. 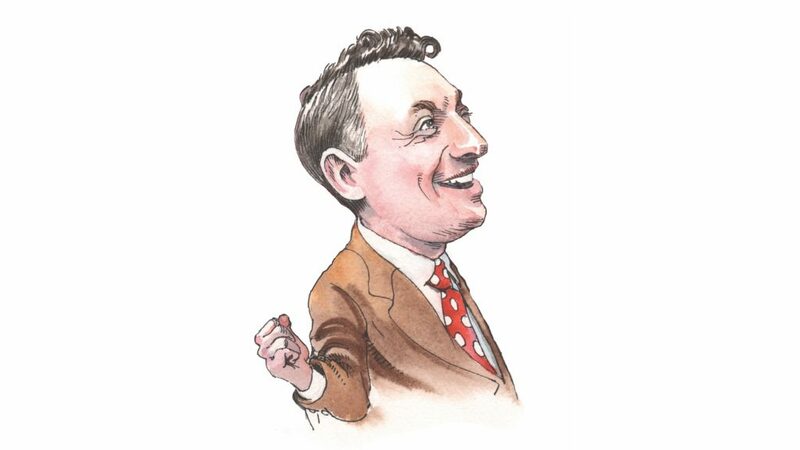 Adam Kirsch is a columnist for Tablet and the author most recently of Rocket and Lightship: Essays on Literature and Ideas (W.W. Norton & Company). is not diminished, being virtual, not actual. Would the demise or even disappearance of human beings be, on the whole, a good thing. Yuval Noah Harari seems to think so, or is at least willing to entertain the thought.